We live in magical times, my friends. I've talked about the challenge of building a 4th generation game engine over at IGN. 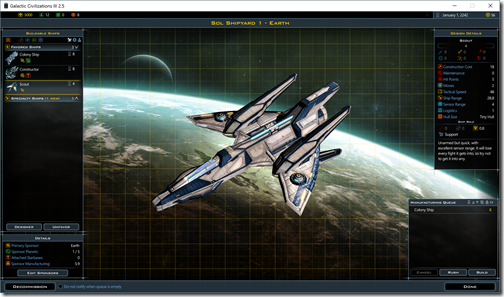 Stardock's first attempt at building a 3rd generation engine failed pretty spectacularly (Elemental). Galactic Civilizations II was arguably a 2nd generation (upgraded) engine. Its code base could be traced back to 1997. So by the time it was released, it was almost 10 years old. 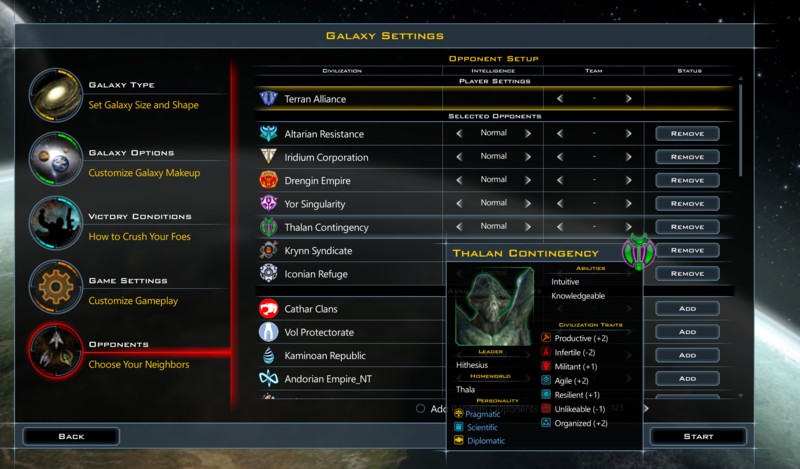 For GalCiv III, we decided to go directly to 4th generation (which meant 64-bit, core neutral). 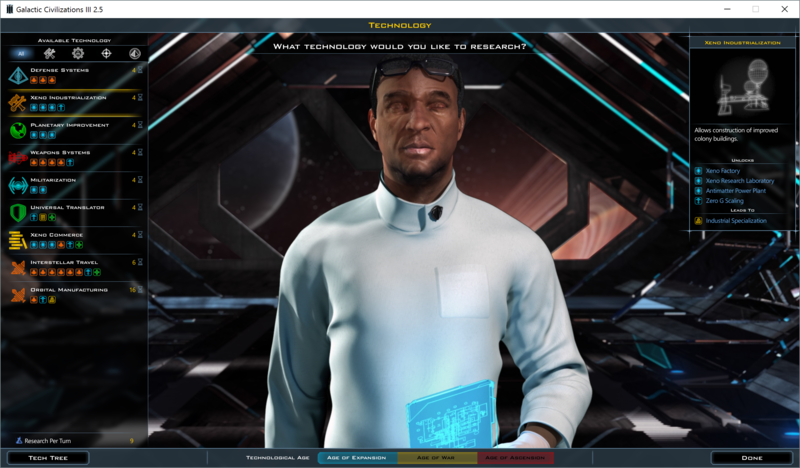 The good news is that this future proofed GalCiv III. The bad news is that we had to throw out 100% of our GalCiv II code. Even our libraries. Everything. For programmers out there who want to know the difference between a 3rd gen and 4th gen engine just by looking at the engine code: 4th gen engines don't use pointers or addresses. You use handles. So think about all that code you have where you're passing around pointers and imagine if you had to throw it all out. For our customers in 2015, this really sucked because GalCiv III, when it shipped, didn't have as many features as GalCiv II: Ultimate Edition. GalCiv II: Ultimate Edition was actually GalCiv II: Dread Lords + Dark Avatar + Twilight of the Arnor expansions combined. 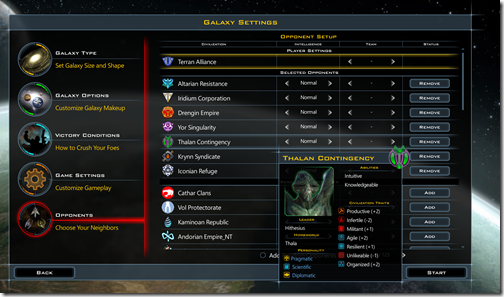 This brings us the upcoming release of GalCiv III v2.5. So far, we've had one small expansion pack (Mercenaries) and one big expansion pack (Crusade). Our goal with GalCiv III v2.5 (the base game) is to bring our code improvements from Crusade without transforming the base game into Crusade. That is, we want people to still buy Crusade of course but we also want to make sure that the base game gets a big improvement. So let's take a look at what's new. The base game gets all the new UI improvements from Crusade. This includes the new check system for better info at a glance. In Crusade, you don't get to start with a shipyard or a bunch of ships. In the base game, you get a shipyard and ships. I don't really like that myself. I suspect we'll be creating a "fast start" option for Crusade players though at some point. Those with Crusade will recognize the UI. You now get the Summary tab on the right from Crusade. But you don't get citizens. 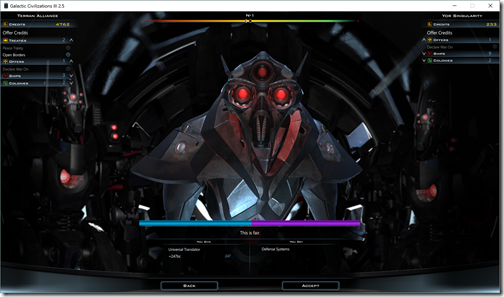 The tech tree is the GalCiv III tech tree but the UI is updated to the Cruade UI. 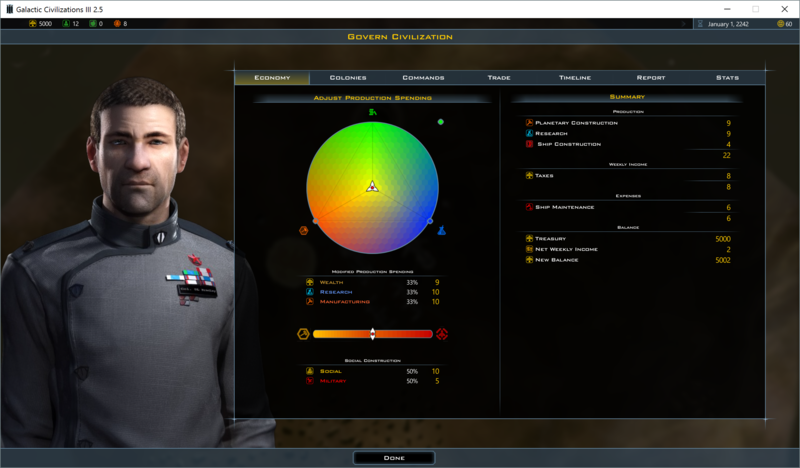 Planets get the Crusade UI but since there are no citizens, there's no bonuses from them. Players do get the word on the street feature. Cosmetically, the ships get the Crusade upgrade but there are no missions (a Crusade feature) available. But it's a pretty huge update for the base game. What you can't see in a screenshot is the performance. 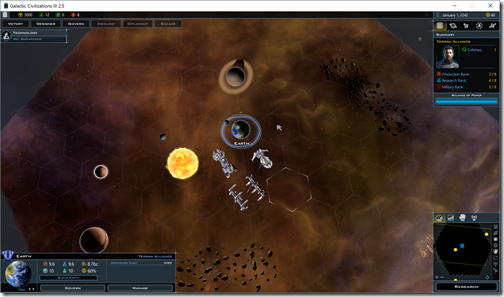 GalCiv III: Crusade moves the AI system to the core-neutral engine. Now, the base game inherits that. 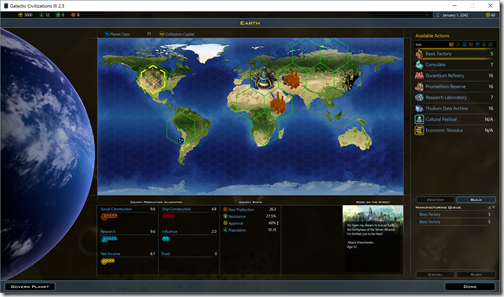 The Diplomacy UI from Crusade moves over along with the underlying AI for it. This includes the barter bar (the boring looking bar in the middle) that makes trading so easy and fun. The AI improvements from Crusade also make it over. The economics of the base game remains mostly the same with one huge difference: Galactic resources now accumulate. 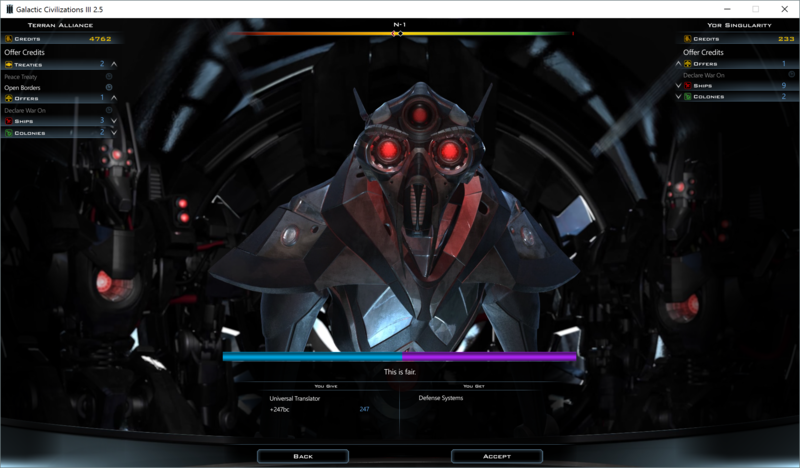 Before, if you controlled 1 anti-matter resource you could have 1 anti-matter using component. We have decided to adopt the accumulation system from Crusade here. Inevitably, someone is going to say "You're basically giving away Crusade!" but Crusade was practically a sequel to the base game rather than just an expansion. And we really don't want to get into the business of charging money for AI/engine upgrades. One nice thing about a single code base is that we can make it so that when you run a given DLC, we can have it inherit the base game's balance. That has been one of the frustrating things for Crusade players. What we want to be able to do is make sure the base game is incredibly compelling on its own. And that Crusade offers a very easy to understand improvement to the game (namely the 5 features I mention above but particularly a citizen based economy). I'll be around this weekend on Discord doing a lot of balance work. Its great Vanilla is getting some love! I wouldn't say "pretty spectacularly" at least not in reality, probably so in perception. Glad to see you still chugging away on base GC3. I've recently kind of lost my space 4x desire. No fault of this or any other game though. So I'm still waiting on your new fantasy 4x announcement at some point! Hint! Hint! Thanks for the behind the scenes, almost ELI5 like description, not just here with the programmer's example, but for doing it pretty often in these types of posts. The "no game left behind" philosophy, is a somewhat rare sight in these rather dark digital times of jumping ship early. Admittedly moved on to Crusade personally, but can really appreciate the effort still, for it goes beyond the individual sphere! While that might add some asymmetry to the civs, I don't think gaining the wheel is worth loosing citizens. 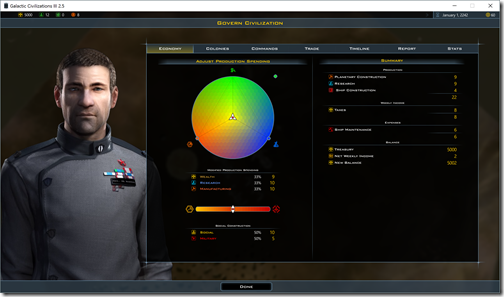 You need admins to colonize and build starbases, spies to, well, spy, commanders give a bonus to fleets etc. Like all the improvements since the Original windows release. Still playing GCIII Crusades. A far cry from the Original Galactic Civ for OS/2 - still have a copy with 5 3.5" disks. Been a long time Frogboy, it is a classic. I've enjoyed every GC since GC for OS/2, but my most memorable game was, and still is, on the OS/2 version. I started next to a corner, surrounded by empty quadrants, and due to the range limits in that game the only choice I had was to fight my way into and then out of that corner. By the time I made it into the center of the map all the other AIs were more powerful than me, and it was a tremendous struggle to survive. Eventually I defeated everyone but the Yor, and no matter what I threw at them I could not defeat the fleet defending their home world. I finally finished them off with a death star. Good times! Anyway, Crusade is great, I'm really enjoying it. Well i enjoyed the game since dark avatar i actually bought galactic civilizations 1 the gold edition it didnt work. Some of my most memorable games were on OS/2 also. I recall one where the sides (I don't even recall the race) were nearly evenly matched and we just kept throwing hundreds of ships in to a killing zone with little change. I managed to make some progress on the right flank, but it wasn't until I was able to start putting out Excaliburs that the tide slowly started to turn. Still have the game somewhere, but nothing to run it on any more. Just downloaded 2.5 and am looking forward to the differences.